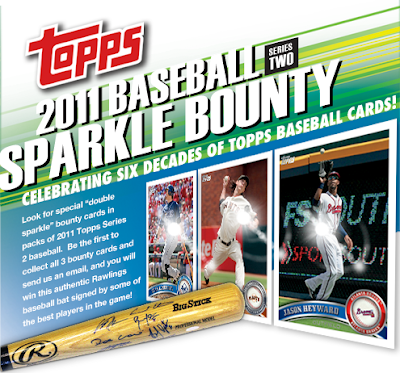 All About Sports Cards: Find the Double Sparkles in 2011 Topps Series 2 Baseball Cards and claim your amazing prize! 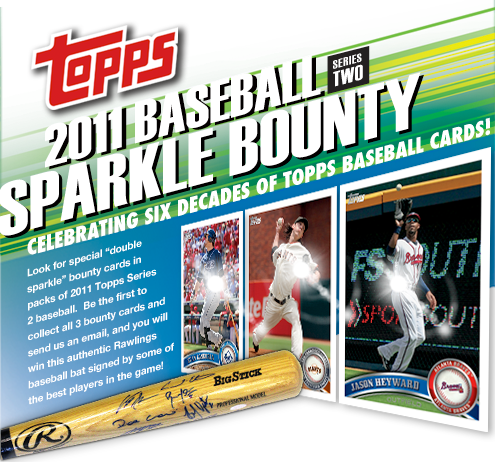 Find the Double Sparkles in 2011 Topps Series 2 Baseball Cards and claim your amazing prize! Double Rainbows are extremely popular, why not Double Sparkles? As you know from our First Day of Release Blaster Box Break, 2011 Topps Series 2 is live. We told you about the first sparkle cards, short prints with tiny sparkles on various locations of a player's card found in Series 1. For Series 2, Topps is still doing the sparkles but has brought it to a whole new level with ultra short prints of Jayson Heyward, Tim Lincecum and Evan Longoria Double Sparkle cards. In addition there is a bounty for the first person to obtain all three and send in a photo of them and the cards. The prize is a certified autographed bat signed by Robinson Cano, Andre Ethier, Curtis Granderson, Russell Martin, Justin Moreau, Hanley Ramirez, BJ Upton, Justin Verlander, David Wright and Ryan Zimmerman. There will also be runner up prizes for those who find double sparkles but don't win the grand prize.